4.5 stars. I thoroughly enjoyed listening to this vivid story told from the perspective of three very different (but all incredibly strong) women living in Jackson, MS at the brink of the civil rights movement. Eugenia (known to everyone as Skeeter) is a young white woman and aspiring author who has just returned home from college. At a local bridge club meeting, she finds herself troubled to hear of a friend's initiative to demand separate bathrooms in every household for the "colored" housekeepers in order to be better protected from any potential diseases they were ignorantly thought to carry. With the tepid support of an editor in NY, Skeeter comes up with an idea to write a book containing interviews of the local maids (often referred to as "the help") as they describe in detail their daily lives serving white families. Skeeter slowly secures the assistance of Aibileen, who raised 17 white children throughout her life, and Aibileen's friend Minny, who keeps getting fired because she has a habit of speaking her mind. Initially, the fear of discovery and retaliation keeps the maids from fully trusting Skeeter with their stories, even though they are promised to be kept anonymous. They (along with several others) ultimately want so deeply for their voices to be heard that they eventually agree to talk, risking their lives to do so. I fell in love with each of these vibrant characters and was moved by the bravery of their plight. The audio version of the book is magnificently read by three wonderful actresses who do an amazing job at bringing these characters and their stories to life. The Help is charming, eye-opening, funny, uplifting and even empowering. It is also not without flaws, however. Some of the characters (particularly Miss Hilly) are a bit overly stereotypical, and the ending wasn't quite as satisfying as I'd hoped. However, I felt these were minor flaws which did not take away from my overall enjoyment. 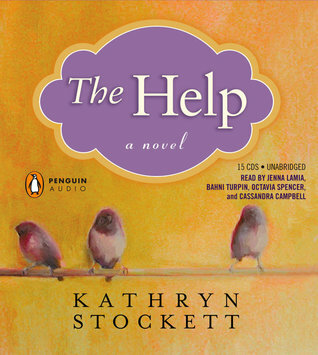 The Help is a poignant first novel by an author from whom I will be anxious to read more in the future. 16.67% "Loving it so far!" Me too, it's going on my list now! And the language didn't bother you at all? The dialect is so ridiculous it made me angry. The book is so trite and predictable and c'mon! Skeeter "accidentally" leaves her precious folder that incriminates half of the black women in the town at a DAR meeting? I couldn't disagree with you more. I know a lot of people like this book, but it's trash, pure and simple. Hi, Melinda. Thanks for your input. I listened to the audio version, and I thought it was exceptionally done. It's rare to find an audio-book so well performed, and thus, for me this bumped my rating from 4 to 5 stars. I also read/listened to the book prior to all the hype and had no idea what to expect. I was very pleasantly surprised. As I note in my review, while I do think it has some flaws, those flaws did not take away from my enjoyment of the book overall. Some reviewers have called this book an instant classic, and to that I would disagree. I definitely don't think it's of the same caliber. But I most certainly would not call it trash. I did not find the dialect bothersome, but again, perhaps this is because I listened to it performed and did not read it in my own voice. In any event, I personally did not find it offensive at all. Aibileen and Minny were clearly the strongest characters in the novel. But books written in the vernacular are often controversial. I understand how a good reading of a book can transform the overall experience...so I appreciate that you told me that you listened to it rather than reading it. If I would have done it that way, I probably would have liked it more because I wouldn't have been just staring at the words on the page rolling my eyes. I listened to The Guernsey Literary and Potato Peel Pie Society from Audible.com and that is probably only a 4 star book but it was a 5+ star listen because it was so beautifully performed. Same with The Pillars of the Earth... kind of a bad book, really, but the narration brought it to life. And I also know about reading books before the hype... I picked up this little book that looked interesting to me called The DaVinci Code about 4 or 5 months before it took off and I quite liked it. Plus, I felt so smug 2 and 3 years later when all the hoopla was going on about it and I had already practically forgotten about it. I do wish I hadn't brought my first edition back to the book store to sell for used. Oh well..... live and learn! omg did u saw the movie i cant beleve a girl was eat pupin a pie it was so funny and nessty ! !